To the summit of Snowdon, since 1896. Snowdon Mountain Railway has been described as one of the most unique and wonderful railway journeys in the world. Snowdon Mountain Railway has been welcoming visitors to Llanberis to experience the awe-inspiring journey by rack railway to the summit of Snowdon since 1896. From the first views of the waterfall plunging into the gorge below at the start of the journey to the breathtaking sights over the sheer edge of Rocky Valley, every moment is memorable. One of the world’s greatest panoramas is revealed as the train reaches the Summit. From above the clouds, standing at the Summit of the highest mountain in Wales and England, both young and old can embrace the invigorating atmosphere of Eryri – Land of the Eagles. Snowdon Summit’s visitor centre, Hafod Eryri, receives on average half a million visitors each year and it’s not hard to see why. On a clear day the views stretch as far as Ireland. The Summit café sells a selection of hot and cold drinks and snacks, making Hafod Eryri the highest refuelling station in Wales and England. The Heritage Steam Experience on ‘The Snowdon Lily’ and ‘The Mountain Goat’. 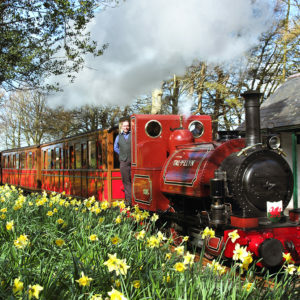 Pushed by original Swiss steam locomotives from 1896, the heritage carriages are accurate reconstructions of the Snowdon Mountain Tramroad & Hotels Co.'s observation carriages. The Snowdon Lily and The Mountain Goat are built on the original chassis and bogies from the carriages of 1896. Travel the way our ancestors did as you journey through the clouds to Yr Wyddfa, Snowdon. Passengers who prefer a little more room are advised to book their trip on the Heritage Steam Experience, seating 34 with a central isle. 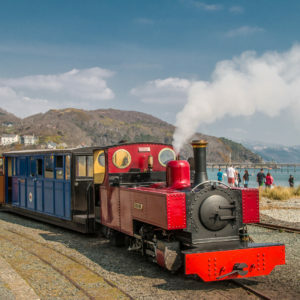 An average of three departures leave Llanberis daily from May to the end of September (weather permitting) and pre-booking is advisable to avoid disappointment. The return journey duration is approximately two and a half hours, which includes a 30-minute stop at the Summit. New passenger carriages were built in 2013 for our Traditional Diesel Service to ensure that visitors to North Wales can continue to enjoy the Snowdon Mountain Railway experience for many years to come. Pushed by Hunslet Engine Company diesel locomotives, the contemporary diesel carriages seat up to 60 passengers. Departures leave Llanberis daily (weather permitting) from mid-March until the end of October, every 30 minutes from 9am subject to passenger demand. 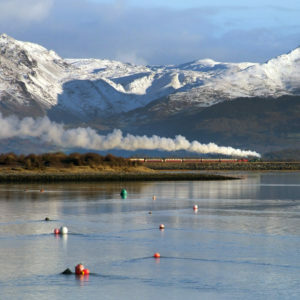 During the early season (March and April), trains are expected to travel to Clogwyn three quarters of the way to the Summit. The nearest BR station is Bangor. Caernarfon/Bangor and Snowdon Sherpa buses stop at Llanberis. 7.5 miles from Caernarfon, 10 miles from Bangor, 17 miles from Betws-y-Coed. There is a pay and display car park behind Llanberis Station.